The Rose Finn Apple fingerlings aren't quite ready to go yet -- still a couple of weeks before their little tubers are quite big enough to start in the ground. 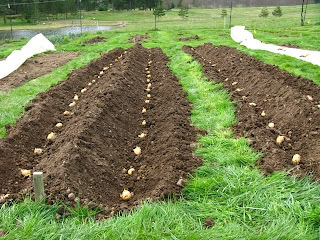 Potato planting is fun and easy. It's the perfect kind of gardening for little kids -- not fussy or delicate like lettuces. 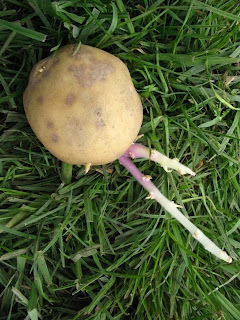 Plus it's an amazing testament to the awesomeness of plants that from one potato comes many new potatoes (unlike beets or carrots where 1 plant = one beet or carrot)! So you start with what you call seed potatoes -- either leftover potatoes from the year before which have been kept in a dark pretty cool place, or certified seed potatoes, purchased from a purveyor of such things. I guess the certified seed potatoes are promised to be free of diseases and other sorts of yucky imperfections, but I tend to think it's cool to grow lots of little potatoes from potatoes that you yourself grew just the year before. Anyway, once the potatoes get a few little "chits" or sprouts (like when you keep those russet potatoes in the bag in your pantry next to those old onions that are slowly decomposing and you pull them out one day to make stew and they're all shriveled and have crazy alien growths)... then you're ready to go. The beds had been cleared and double-dug (yay Dylan! yay me! ), so the next step was to twist in some compost with a spading fork. Then we hoed the 4x25 ft bed into two long valleys with a big peak in the middle and two lesser peaks on the outside. Next, we placed the potatoes in, 12 inches apart. 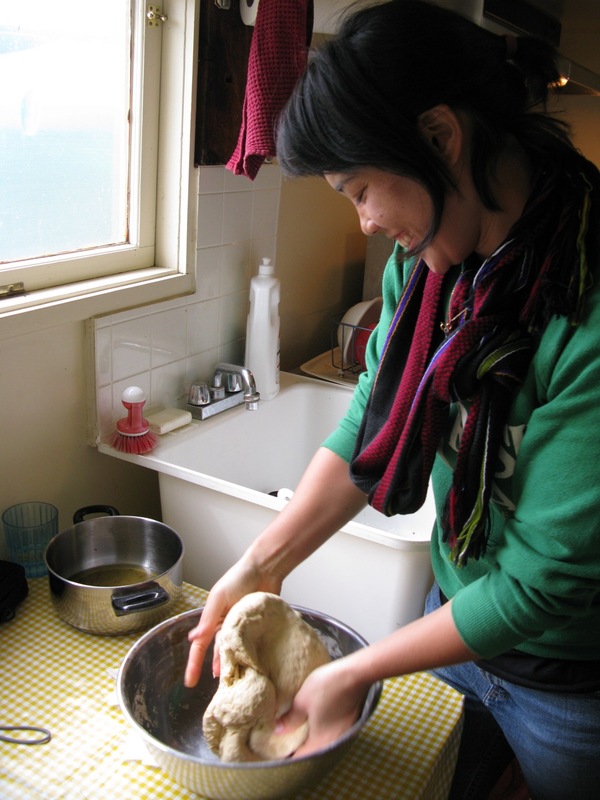 Then we "hoed" the potatoes in -- or basically covered them with dirt. EASY! 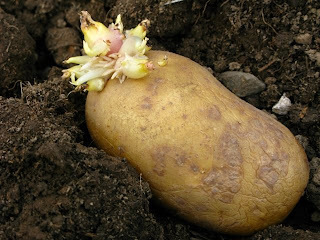 Once they get going and sprout some leafyness, we'll be moving the middle mountain, to pile dirt up around the stem and keep the potatoes well buried so they don't get any sinister hints of green. those potatoes look hilarious :) i am totally impressed with your gardening skills!